Earlier this week, while out on my long morning walk, I was listening to a podcast. The interviewer asked the guest about her inspiration (the guest is a food & lifestyle designer) for the recipes she creates and the tables that she adorns for her dinner parties. The guest replied that she’s inspired by colors, travel, ingredients in her pantry, her mood, social media…the list went on and on. But it got me thinking about what motivates me to create a new recipe to share with you. So much in the world inspires me everyday, I take for granted all of the stimulus that I encounter, whether consciously or unconsciously, which helps shape what I do from moment to moment. Last summer, my husband and I spent a week in Santa Fe, NM. We rented a beautiful casita on a quiet street, within walking distance to downtown and the rail yard. And Whole Foods Market. That’s right, there was a tall wall behind the casita, and on the other side of the wall was the city’s Whole Foods. As with any Whole Foods, the parking lot was always a complete nightmare and the aisles crammed with shoppers; but since I could easily walk to the store, I had no complaints. Part of the reason that we rented the casita was because it had a well-appointed kitchen. I had visions of cooking elaborate meals while on vacation, using lots of fresh local ingredients from the desert SW. In actuality, I made simple meals when we ate “at home”, and stocked the fridge with convenience items that I would make from scratch in my own kitchen. One of those items that I bought was hummus, my daily afternoon snack. Or morning snack, depending on the day. The hummus that I bought in Santa Fe was the best store-bought hummus that I’ve ever purchased. It was from a small producer in Colorado (of course I can’t remember the name of the brand) and the flavor was out of this world. Lemon-turmeric hummus, a bright yellow blend of acidic citrus and mellow spice, it stained my fingers for days as I scraped every last bit out of the container, but I didn’t mind. I enjoyed the hummus everyday during our time in Santa Fe and was sad to leave and return to oppressively muggy Baltimore. But I had an inspiration for creating a new hummus recipe and know that I could bring those flavors of the store bought hummus to life in my own kitchen. Fast forward to last weekend for inspiration #2. We were in Philadelphia for the weekend, and no trip to Philly is complete without eating at one of Chef Michael Solomonov’s restaurants! Since we didn’t have a reservation at Zahav, we knew our choices would be Goldie for falafel, Dizengoff for Israeli street food, or Federal Donuts for donuts & fried chicken. As luck would have it, the Whole Foods in Center City has a food court area with all 3 of those restaurant offerings - a big win for the Grosman family! I ordered a falafel from Goldie and chose the flavor of the tahini sauce that would be tossed with the sandwich’s vegetables (this isn’t the most conventional way to order falafel, I realize). Flavored tahini? Original, Amba, Harissa, and Schug. I opted for the Amba (a sweet-spicy Middle-Eastern mango condiment), and as the sauce dripped down my chin, I had a thought. I could make an enhanced tahini to blend into my homemade hummus as a way to flavor the hummus. I’ve made plenty of alternative-flavored hummus in the past (like this one and this one) but I’d never considered the tahini as the source of the flavor. I couldn’t wait to get home, into my kitchen, and let my creative juices flow! 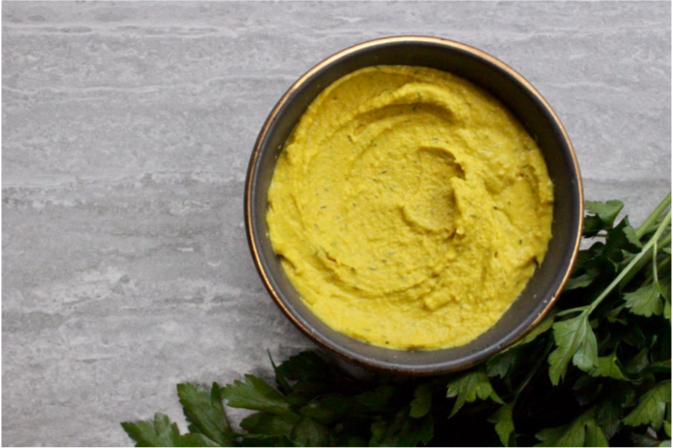 Today’s recipe is two-fold, it’s a recipe for a lemon-dill-turmeric tahini sauce, which can then be blended into chickpeas to make a lemon-dill-turmeric hummus. Both recipes are very simple and will leave you with vibrantly-yellow sauce and dip to wake-up your taste buds. If homemade hummus isn’t your thing yet, why not give it a try? Looking for a way to jazz-up some roasted potatoes or root veggies? Look no further than the tahini sauce, it’s the perfect topping for nearly everything that I’ve cooked this week! Where do you find inspiration? I hope that my weekly newsletters and recipes gently encourage you to get into the kitchen and cook for yourself, your family and friends. I promise you, there’s really no greater way to bring nourishing food into your life than by making it yourself. Take a few moments, you’re worth it! Into the bowl of a mini food processor, add the tahini, 2 T lemon juice, turmeric powder, dried dill, and 1/4 sea salt. Pulse until the ingredients come together as a thick paste, scraping down the sides of the bowl, as needed. Pour 1/4 C cold water into the processor and pulse to incorporate. Add additional water, by tablespoon, as needed to reach a smooth, yet thick, consistency. Remove the tahini sauce from the food processor to a bowl and set aside. Into the bowl of a larger food processor, add the chickpeas. Pulse until the beans are broken-down, but not yet smooth. Add the olive oil, 2 T cold water and lemon juice. Process until the mixture is smooth, stoping to scrape-down the sides of the bowl, as needed. Once the chickpeas are smooth, add 1/2 C of the tahini sauce, along with 1/4 t sea salt to the food processor and blend until combined. Taste and adjust seasoning, if needed. Remove the hummus from the processor to a bowl, cover and chill for at least one hour, to allow the flavors to blend. To serve, bring hummus to room temperature and stir to soften. Enjoy the hummus with pita bread & falafel, as a dip for vegetables, or on a sandwich. The remaining tahini sauce is a wonderful accompaniment for roasted potatoes, falafel, chicken kebabs, or incorporated into a salad dressing. To serve the hummus and tahini sauce together, spread the hummus in a dish and top with a large spoonful of the sauce. Decorate the dish with some freshly chopped herbs, if desired.